Every part of your day impacts your goals, so Fitbit Inspire and Inspire HR track all-day steps, distance, active minutes and calories burned. Fitbit Inspire and Inspire HR use SmartTrack to automatically recognise workouts like walks, runs, swims, bike rides and more, then records them for you in the Fitbit app. Swimproof, so you can wear your tracker in the shower, pool and beyond. * Plus, it automatically tracks how long you’re swimming. The Inspire and Inspire HR touchscreen has a backlit OLED display and responds to natural swiping and scrolling. Customise Inspire and Inspire HR with lots of clock faces options, like a helpful stats clock face for workouts or a polished clock face for work. Fitbit Inspire and Inspire HR automatically connect to 200+ Android, iOS and Windows 10 devices to give you a cohesive view of your progress dashboard in the app. Fitbit Inspire and Inspire HR are lightweight and stylish with a sleek appearance that blends seamlessly with the jewellery you already love to wear. 24/7 heart rate helps you maximise your exercise sessions, understand heart rate zones, see advanced sleep stages and better track calorie burn. Available on Inspire HR only. 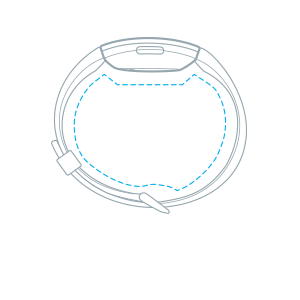 Wear Fitbit Inspire HR all day and night to record your resting heart rate and track heart rate over time. Available on Inspire HR only. Recognise your Fat Burn, Cardio and Peak heart rate zones to optimise each of your workouts with just the right amount of effort. Available on Inspire HR only. Use Inspire HR with your Fitbit app to get your Cardio Fitness Score—a snapshot of how fit you are—plus tips to improve. Available on Inspire HR only. Inspire HR and your app show you how much light, deep and REM sleep you get and provide pointers that can help improve sleep quality. Available on Inspire HR only. 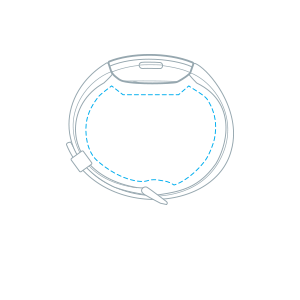 Connect Inspire HR to your phone’s GPS to see real-time pace and distance on your wrist during walks, jogs, hikes and bike rides. Available on Inspire HR only. Choose from exercises like Bike, Run and Yoga & set targets for calorie burn, distance or time to get real-time updates when you reach each goal. Available on Inspire HR only. Fitbit Inspire HR helps you find moments of calm throughout your day with personalised guided breathing sessions based on your heart rate. Available on Inspire HR only. Inspire band fastens with a peg and loop. 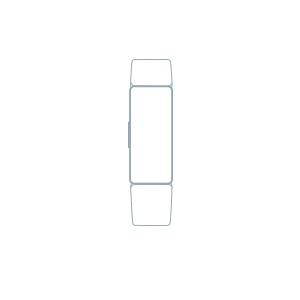 Inspire HR band fastens with a buckle and tang. Fitbit Inspire and Inspire HR have up to 5 days of battery. Battery life and charge cycles vary with use, settings and other factors; actual results will vary. We recommend charging your tracker every few days to ensure you are always tracking. Fitbit Inspire and Inspire HR are water resistant to 50 metres. After swimming or getting the band wet, we recommend drying the band because, as with any wearable device, it&apos;s best for your skin if the band is clean and dry. We do not recommend wearing Inspire or Inspire HR in a hot tub or sauna. See www.fitbit.com/productcare for more details. The Fitbit Inspire band is made of a flexible, durable elastomer material similar to that used in many sport watches, and fastens with a peg and loop. The Fitbit Inspire HR band is made of a premium, comfortable silicone (also similar to that used in many sport watches) and fastens with an aluminium buckle and tang. Fitbit Inspire and Inspire HR sync automatically and wirelessly to 200+ leading iOS, Android & Windows 10 devices using Bluetooth LE wireless technology. Syncs with iPhone 4S and later, iPad 3 gen. and later, Android 5.0 and later and Windows 10 devices. Check yours here.